For decades, I followed this practice, using double digging to amend my poor sandy soil and make it a welcoming home for plants. More recently, however, double digging has come into disfavor. This topic came up early in my Master Gardener course. One classmate reported seeing bumper stickers in her affluent coastal town that read “Friends don’t let friends double dig.” The University of Maine scientist who taught our class on soils seemed mystified by this controversy. The university’s agricultural scientists warn against damaging soil structure through “recreational tilling,” but they consider tilling in soil amendments an important part of taking care of the soil. To understand my dilemma, you need to understand that my property sits on a big glacial sand deposit, and that my soil is what soil scientists call “loamy sand.” The diagram above shows different types of soil textures, depending on their mix of sand, clay and silt. As you can see, “loamy sand” is just one step up from pure beach sand (in the lower left corner of the triangle); it is a mixture of 70-85% sand with small amounts of clay and silt and has almost no organic matter. Not only are there relatively few plants that will grow happily in this loamy sand, but it is also very poor at retaining either moisture or organic matter. So if I want to garden here, the question is not whether to add organic matter to the soil, but how. To decide whether or not to double dig my new flower beds, I needed to consider (1) alternative methods for adding organic matter to the soil and (2) the reasons why double digging has fallen into disfavor. Let’s start with the alternatives. One is to add organic matter on top of the existing soil and let it work down into the soil over time. This is the method I use to recharge organic matter in existing flower beds. But I didn’t consider this a workable alternative for my new garden areas; I’m in my late sixties and can’t afford to let years go by while I wait for organic matter to build up in the soil. Another alternative is the “lasagna” method, which involves covering the existing ground with cardboard or wet newspaper and then piling several inches of compost on top. The idea is that the cardboard or newspaper kills any sod or weeds while the organic matter improves the soil. I used a variation on this method to create the raised bed in my back garden, but I don’t want my front garden to consist of raised beds and it seemed as though I would have to pile the organic matter up quite high in order to put plants in right away (rather than waiting for the weeds to die, the cardboard or newspaper to decompose, and the organic matter to work its way down into the soil). A third alternative is tilling rather than digging, spreading several inches of organic matter on top of the soil and then turning it under gently with a garden fork. To decide between tilling and double digging, I needed to look at the arguments against double digging. The main ones are (a) that soil plays an important role in carbon sequestration so that digging releases carbon into the atmosphere and (b) that digging destroys soil structure. I quickly decided that carbon sequestration wasn’t really an issue in my case; it is the organic matter in soil that provides carbon, and the big problem with my soil is that it lacks organic matter. Soil structure, however, is a trickier issue. Soil structure refers to the way that particles of soil are arranged, particularly the ways that bacteria, fungi, and organisms like worms bind particles together into clumps or soil aggregates. In my earlier double-digging days, I would carefully break up clumps into friable crumbs of soil. Now I know better; soil aggregates are an important part of healthy soil structure, and disturbing the soil inevitably damages soil aggregates. Because my soil had already been disturbed by the construction process, however, there weren’t many soil aggregates to damage. I decided that double digging is a reasonable way to add organic matter to this backfilled soil. Sure enough, as I have worked with the soil, I have encountered very few clumps. I dig out soil to the depth of my spade and pile it into my wheelbarrow, removing weeds and their associated roots as I go. I also remove any rocks or large stones, but I try to leave any clumps of soil undisturbed. Occasionally, I encounter a lump that may be a soil aggregate or may be a soil-covered rock. In the past, I would have squeezed it to find out, breaking apart the clumps of soil. Now, I tap these lumps gently against the side of my wheelbarrow. If they are rocks, they make a metallic “thunk” sound, but soil aggregates make a soft thud. When I put the soil back into the ground, compost and cow manure have been mixed in with the sand and loamy clumps. As I worked to amend the soil on my back slope, I noticed a big difference in soil structure when I reached an area that had not been disturbed by the construction. Here my digging did disturb soil aggregates, and a different method for adding organic matter probably would have been preferable. This means that I will need to rethink how I add organic matter to my soil as I begin (next year) to work on sections of the front garden where the poor sandy soil was not disturbed during the construction of my house addition. I’ve struggled with this controversy too, Jean. Your post is the most comprehensive discussion of the issue I’ve read. The soil on our property varies dramatically, from heavy clay to mostly sand, which I’m guessing is at least partly attributable to prior construction on the site and the hardscaping and landscaping efforts of prior owners. (I found a layer of clear plastic laid several inches below the soil’s surface in one large area, presumably part of a misguided effort to control weeds.) In general, I’ve proceeded as you have, although I’ve also imported top soil to raise soil levels in some areas and improve drainage in some areas, creating low berms. I worried about impairing the soil structure too but, thus far, the areas I’ve dug and amended have been more productive than those I’ve left alone. I’ve also read that plant roots can have problems moving from one soil mix to another so, when I supplement the soil, I’ve tried to mix the ingredients as thoroughly as possible to minimize any such impacts. Kris, I think we’re all trying to figure this out as we go, partly through a process of trial and error. My understanding of the problem with plant roots is that if you enrich the soil in the planting hole, but not beyond it, the plant will prefer to grow roots round and round in the enriched soil than to venture out into the poor soil. I’m lucky enough to have bought myself a house with a garden where most of the soil is absolutely beautiful black, rich soil. The slightly raised beds towards the road, though, seem to have been given less manure and compost, because they dry out in the blink of an eye and I haven’t managed to successfully plant anything new out there this year. Soren, How lucky you are to have good garden soil in most of your property. A little gentle tilling in of organic matter does seem like a good strategy for an area with some established plants but poor moisture retention. Part of the issue is the Southern exposure – and the lack of shelter from winds. I actually think the open fields around me is part of the reason my garden is generally on the dry side, since the wind really gets going. On the plus side, laundry dries in a few hours! As you say, If the soil is really poor to begin with, double digging or tilling in good organic matter is essential. But if the soil is good, adding layers of compost and other organic matter atop the soil is better. This is what works for me in my heavy clay soil, which is high in plant nutrients but has terrible soil structure: I don’t prepare an entire bed for planting, other than top-dressing the area with compost and other amendments. Then I dig holes for individual plants, up to 3-4 times the width of the root ball, and add lots of organic matter to the individual planting holes. Deb, This is why I think it’s important to understand the reasoning behind the “rules” — so that we can figure out the solutions in our own situations that will be both effective and environmentally responsible. Jean I applaud you for making this huge effort to improve your soil. I’m also envious that you can double dig. Through our local agricultural extension I learned that my ‘top’ soil is probably the fourth level down of sub-soil…it’s like glacial till…full of tiny rocks and compacted. This is the result of over logging by the previous owners who planted pine trees as a relatively quick cash crop and harvested every ten years. Multiple years of heavy equipment and bulldozing destroyed the soil like construction does. 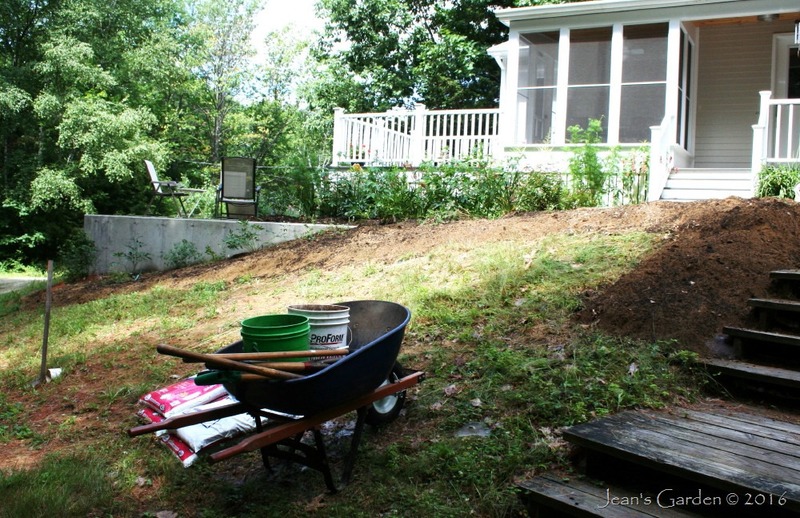 I spent the last twelve years creating soil by bringing in mulch, mushroom compost, top soil, organic fertilizers and buying a chipper shredder to shred the leaves of the hardwoods on the property and using them as mulch. I’ve created raised beds for my vegetable garden. I have three compost bins but cannot make enough myself. I’ve also used the newspaper method you mention. When I see worms or mushrooms springing up, I do a happy dance! It has been a lot of work but I now have the most beautiful gardens I’ve ever had. Thanks for another great post. Happy digging! Kathy, I think I might have been daunted by your soil conditions. Congratulations on your perseverance and your success. I have a chipper, and our shrubs and trees give me lots of mulch, after I have pruned back to fit a small garden. We are lucky that the huge diversity of fynbos mostly grows on sandy soil. Still patiently picking out bits of concrete and Rubbish, as if I was collecting plastic waste on the sea shore. Somehow rain brings the rubbish to the surface for removing. Diana, Isn’t it amazing (and annoying!) how much rubbish the contractors leave behind. I have finally set aside a special trash bag for all the construction debris I’m digging up as I prepare the soil for this section of garden. I should probably buy myself a small chipper/shredder so that I could improve my ability to compost leaves and twigs. My own preference would be to top dress with compost and an organic mulch. Jason, That works for me in already established garden beds. Mostly I use a fairly fine finished organic compost as mulch and let it work its way into the soil over time. For new garden areas, though, I need to get the organic matter down into the soil to provide both nutrients and water retention for plant roots. We have all gotten so much more sophisticated in how we partner with mother earth. I can’t imagine a conversation like this with either my mother or grandmother as I worked with them to get their vegetable gardens ready for for the growing season. Hello Jean, we had no option but to completely work the soil over for the new borders we were making by thorough mechanical tilling. Our soil is a few feet deep sitting on compacted wet sand and is completely air-less and utterly solid, heavy wet clay. The only way anything was going to grow in it was to introduce air, organic matter and compost and till it through all levels down to the sand layer. It’s a great deal of hard work but the results speak for themselves. Once this initial process is done, all that should be needed is top-dressing/mulching and very light (surface) digging.